These properties are in common for all menu objects unless otherwise noted! Normally the menu items are sorted by the fields "sorting" in the pages- and tt_content-table. Here you can enter a list of fields that is used in the SQL- "ORDER BY" statement instead. You can also provide the sorting order. 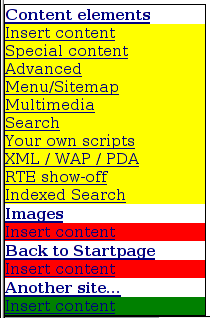 This property works with normal menus, sectionsIndex menus and special-menus of type "directory". The minimum items in the menu. If the number of pages does not reach this level, a dummy-page with the title "..." and uid=[currentpage_id] is inserted. The maximum items in the menu. More items will be ignored. The first item in the menu. .newWindow: Boolean. Lets every menu item open in its own window opposite to opening in the same window for each click. Prefix for the image names. This prefix is appended with the uid of the page. Note: Don't set this if you're working with a menu with sectionIndex! In that case you need special unique names of items based on something else than the uid of the parent page of course! Applies to GMENU, TMENU and IMGMENU. If set, then all links in the menu will point to this pageid. Instead the real uid of the page is sent by the parameter "&real_uid=[uid]". This feature is smart, if you have inserted a menu from somewhere else, perhaps a shared menu, but wants the menu items to call the same page, which then generates a proper output based on the real_uid. Additional parameter for the menu-links. integer (page id) / keyword "NONE"
If set, pages in the menu will include pages with frontend user group access enabled. However the page is of course not accessible and therefore the URL in the menu will be linked to the page with the ID of this value. On that page you could put a login form or other message. If the value is "NONE" the link will not be changed and the site will perform page-not-found handling when clicked (which can be used to capture the event and act accordingly of course). This means that the link's URL will point to the page even if it is not accessible by the current frontend user. Note that the default behavior of page-not-found handling is to show the parent page instead. .addParam = Additional parameter for the URL, which can hold two markers; ###RETURN_URL### which will be substituted with the link the page would have had if it had been accessible and ###PAGE_ID### holding the page id of the page coming from (could be used to look up which fe_groups was required for access. The example will link access restricted menu items to page id 22 with the return URL in the GET var "return_url" and the page id in the GET var "pageId". Adds an additional part to the WHERE clause for this menu. Make sure to start the part with "AND "! The first variable passed to this function is the "menuArr" array with the menu items as they are collected based on the type of menu. You're free to manipulate or add to this array as you like. Just remember to return the array again! .parentObj property is hardcoded to be a reference to the calling typo3/sysext/frontend/Classes/ContentObject/Menu/ object. Here you'll find e.g. ->id to be the uid of the menu item generating a submenu and such. You can override element states like SPC, IFSUB, ACT, CUR or USR by setting the key ITEM_STATE in the page records. Defines a suffix for alternative sub-level menu objects. Useful to create special submenus depending on their parent menu element. See example below. Applies to GMENU and TMENU on >= 2 nd level in a menu.